The NHS was established in 1948 by the post-war Labour government. It was based on principles of funding by general taxation and was meant to meet the needs of everyone, be free at the point of care, and based on clinical need not the ability to pay. Underpinning this was an assumption that the healthcare system was universal and comprehensive. General practitioners were allowed to remain independent self-employed sub-contractors to the NHS, while consultants (specialists) became employees of the hospital systems. The system started to evolve very quickly. Within four years, charges were introduced for prescriptions, followed by charges for dental care and glasses. In the 1980s, administrators were replaced by general management in health authorities and hospitals, but there was still an integrated structure based on geography, and services provided across a locality were commissioned and provided by the same organization. In the early 1990s, we began to see the development of an internal market in health care, with a separation of the commissioning and provision of services. In 1991, the first NHS (Provider) Trusts were established, separate from the commissioning Health Authorities. In 1998, Scotland, Wales and later Northern Ireland assumed local responsibility for health and adopted divergent strategies, primarily maintaining integrated service provision under a Health Authority or Health Board. From that point on, there have been four healthcare systems under the broad umbrella of the NHS. In 2002, Primary Care Trusts were established in England to identify the health needs of a local population, commission services for that population, and provide community services. And in 2004, the first wave of NHS Foundation (Hospital) Trusts were established in England after a very difficult negotiation and passage of a much-contested bill that some considered the first move to privatization of the healthcare system. Foundation Trusts are independent legal entities with no direct accountability to the Department of Health or the Secretary of State for Health. A Foundation Trust has its own Board, constitution and governance. It is accountable to its membership, made up of patients, local community and staff. The Trusts are licensed by an independent regulator, called Monitor, and the license defines the mandatory services a Trust must provide. Beyond those services, Foundation Trusts are free to provide or not provide other services as they choose. They also have considerable financial and operational freedom in how they deliver services, if not on what services they provide. The standards of the NHS are still delivered by the Foundation Trust and there is a very clear linkage between the Trust’s contractual performance and its income. The NHS continued to evolve with, in 2008, the establishment of the principles of Patient Choice, a step designed to make the NHS more responsive to the needs and expectations of patients. And increasingly, patients were viewed not as supplicants who had to wait and tolerate care delivered by the system at a time and in a manner that suited the system, but as “customers” who could expect treatment that was considerate of their requirements. In 2009, the NHS Constitution was established for the first time by legislation, with a number of legal commitments to patients. There were commitments around maximum waiting times for treatment, patient choice, access to health records, the right to be treated with dignity and respect, and the right to complain and receive a response. There was a commitment to provide responsive and timely service and for treatment to be based on evidence and provided in a clean and safe environment. A public opinion poll conducted in 2008 found that 73% of the population considered that the NHS was providing good service; 68% considered that the NHS required additional funding; 70% considered that the NHS was one of the country’s most effective and important institutions; and 80% wanted less “political” interference in the NHS. Support for the NHS has consistently run close to 70% to 80% among the public. However, polls also revealed public concern around the lack of investment in the NHS; excessive bureaucracy and top-heavy poor management; a lack of nurses and doctors; waiting times; and the issue of cleanliness in hospitals. The decade-long Labour administration very significantly increased funding in the NHS, from £45 billion in 2000 to £110 billion (18% of total government spending and 7.5% gross domestic product [GDP]) in 2010. Annual budget increases in that decade were around 7%, vs a 60-year average of 4%. There were very significant improvements in access to treatment, with patients guaranteed to see their family practitioner within 48 hours, and a commitment to ensure that 98% of patients were seen, treated and either admitted or discharged within four hours of presenting at the ER. Evidence-based practice was introduced with the establishment of the National Institute for Clinical Excellence (NICE). The National Patient Safety Agency assured improvements in that area, some action was taken in health promotion, and there was increasing recognition of the importance of chronic disease management. This past decade brought undoubted improvements in patient experience, reductions in health inequalities, equity of access underpinned by legislation, independent regulation of quality and improved professional regulation. On the whole it was a good decade for the NHS, certainly in England. But one consequence was that 50% of the increase in funding was spent on pay and there was therefore a decrease in efficiency and productivity across the NHS. New payment systems moved from contracts to payment by results, which was actually payment by activity rather than results. A centrally-driven culture of targets emerged with an associated increase in bureaucracy and management costs. In the 2010 general election campaign, the Conservatives talked about more control to doctors and nurses within the health service, more local control of services and standards, fewer national targets, a reduction in bureaucracy, a 33% decrease in management costs, a commitment to have no more top-down reorganization of the NHS, and a commitment to continue real annual increases in funding for the NHS. The platform fitted into a Conservative party policy and philosophy of public service reform to introduce more competition, transfer risk increasingly to the private sector, ensure strong, independent regulation of services, clear standards and lines of accountability and more information to patients, as well as maximize the number of providers and ensure equitable access without sacrificing efficiency and equality. What they forgot was that the NHS is the nearest thing to a national religion in the U.K. The May 2010 election resulted in a hung parliament with no overall majority. The government formed by the Conservatives and the Liberal Democrats is the first coalition government since 1945. In line with Conservative campaign commitments, the government produced a White Paper on reform of the NHS in July 2010. It introduced some of the principles they had talked about in their earlier manifesto by putting patients at the heart of the NHS, changing the emphasis of performance from activity and process to clinical outcomes, and shifting power from the Department of Health to clinical professionals, particularly family practitioners. The Health and Social Care Bill that was presented following this White Paper in January 2011 introduced market-based reforms and expanded Monitor’s role from independent regulator of the Foundation Trusts to also include economic regulation to promote competition, regulate price and safeguard continuity of services, in a similar way to how the utility sector in the U.K. is regulated. The Bill called for patient choice for all (not just some) NHS-funded services by 2013-14, backed by improved access to information on provider performance. Competition was to be encouraged by introducing the principle of “any willing provider” and could be based on tariff and price. Monitor would set fixed prices but would also allow specification of a “maximum tariff” per activity, allowing competition on price as well as quality. There were provider reforms within the Bill as well. All NHS providers were to become Foundation Trusts by 2014. And those that were not able to do so were effectively to be taken over, put onto the market or absorbed by other NHS organizations. A Provider Development Agency would be established to oversee this process. Governance responsibilities would be transferred from Monitor, which was taking on the economic regulator role, to Foundation Trust Boards. The cap on commercial borrowing, private activity and private income imposed on Foundation Trusts would be lifted. The Bill also foresaw support for employee-ownership models for NHS providers and the development of social enterprises to run services. It allowed for provider failure while requiring Monitor to protect access to essential designated services. It replaced payment by activity with payment by outcome. The Bill also contained commissioning reforms, with the abolition of Primary Care Trusts, the establishment of locality-based Commissioning Consortia led by GPs by 2013, and the establishment of an independent Commissioning Board for the NHS to commission specialist services and primary care services, and to hold GP Commissioning Consortia to account. Local Authorities were meant to take responsibility for Public Health and run Health and Wellbeing Boards to integrate local NHS services, social care and health improvement. Patients were seen to be at the heart of NHS via information and choice and the term “No decision about me without me” was coined by David Cameron. Patients were to have access to information on services and outcomes by organization and individual clinician, along with the ability to choose their GP, hospital and specialist. Patient ratings of services would be recorded and made available to others and patients and the public would be involved through something called the “Health Watch”. Performance would be measured against “evidence-based outcomes” rather than activity. The focus on quality was also an important part of the Bill. The Care Quality Commission would serve as an independent quality regulator for health and social care. All providers to the NHS would be registered and would receive bi-annual assessments of compliance with the quality outcomes framework. Providers would have incentive to improve quality because their contract income would be linked to performance on quality and they would incur financial penalties if they failed to meet quality standards. A report on quality outcomes by provider would be prepared, and be available alongside annual Quality Reports from all NHS providers. The Bill aimed to reduce bureaucracy and management costs through the abolition of the regional tier of governance and significant reductions in the functions of the Department of Health. The Bill committed to a 45% reduction in management costs. Investment in health research was to be preserved. A significant reorganization of arrangements for medical, nursing and allied healthcare training would move towards more integrated local commissioning of training and delivery of inter-professional training. The financial context in which these proposals were put forth included a 2011 NHS budget of £122 billion (7.9% of GDP), with £119 billion of that going to clinical services. However, the figures were changed following the economic crisis. Rather than the 7% per annum increase seen in the last decade, the annual increase over the next five years will be 0.1%. The NHS will have to produce £20 billion in efficiency savings by 2015, requiring at least a 4% increase in productivity and efficiency. Some contractual arrangements, such as the national employee Terms and Conditions, result in an incremental drift of the costs of employment of about £1 billion per annum. 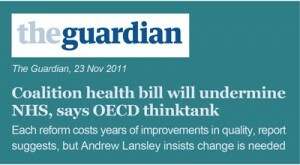 The government’s increase in value-added tax (VAT) to 20% in early 2011 added £250 million to the NHS costs. And the transitional costs of the reorganization are in excess of £500 million. The legislative process for the Health and Social Care Bill started with the publication of the White Paper Equity and Excellence: Liberating the NHS in July 2010, followed by consultations until October 2010. The government response to the consultation was a Command Paper, published in December 2010, indicating there was not going to be an awful lot of response to the consultation. The Bill was published without any significant changes and started parliamentary passage in January 2011. It was met with significant widespread concern in Parliament from the Labour party, Liberal Democrats and even some Conservatives. There was extensive criticism from the Parliamentary Health Select Committee, which produced alternative proposals, and there have been significant challenges in the House of Commons. Further challenges in the House of Lords are anticipated. The non-parliamentary reaction was even more vociferous. There was very strong opposition from the membership of the Liberal Democrat Party, not just the Members of Parliament, and broad opposition (as anticipated) from the public sector unions, but also from the British Medical Association and the Royal College of Nurses. The Royal Medical Colleges and NHS Confederation also expressed major concerns. The Kings Fund, one of the more effective policy groups within the U.K., was particularly concerned with the step change in the application of market-based principles, the very radical reform of commissioning and accountability within the new commissioning arrangement. They felt that the risk of privatization was increased with the “any willing provider” clause. 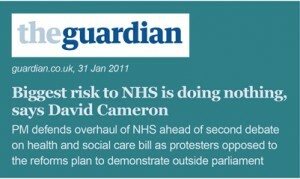 They pointed out that this was the biggest reform and reorganization of the NHS since it was first established in 1948. Competition was seen as being pushed at the expense of collaboration and integration. It also seemed a great challenge to deliver this reform in such a tight financial climate. The Kings Fund was not convinced that the proposed changes would effectively deliver the desired outcomes, and suggested a number of changes, some of which were included in the updated Bill that entered the House of Lords. In April 2011, there was a vote of no confidence in Andrew Lansley as Secretary of State and calls for his resignation from across public sector unions. The Prime Minister announced a three-month “listening pause” in the parliamentary process and set up an independent panel called the NHS Futures Forum to review the Bill and consult on proposed changes. He also promised, this time, to introduce amendments to the legislation as necessary. In June 2011, the independent panel’s report was published, followed very quickly by the government response, which introduced over 100 changes to the Bill. In September 2011, the Bill was approved by the House of Commons and in October it passed a major test in the House of Lords. The Bill is currently being reviewed clause by clause in upper chamber committees in the House of Lords and is likely to pass into legislation by the end of 2011. But already, 350 amendments have been tabled in the House of Lords and there are likely to be more. The coming year will see significant changes to the NHS in England, though not in other parts of the U.K. The Secretary of State will retain ultimate responsibility for the NHS, despite earlier efforts to offload this responsibility. But whether it will be a responsibility to deliver a universal and comprehensive service remains to be seen. The Department of Health’s role will be restricted to forming policy and overall resource allocation. Other functions will fall to a central “independent” NHS Commissioning Board, local GP lead Clinical Commissioning Consortia, local Health and Wellbeing Boards and NHS Foundation Trusts. The “any willing provider” clause was changed to “any qualified provider,” which is a sop to those who are concerned about the marketization and privatization of healthcare services, and there will be a single Quality Regulator and Sector Regulator for health care in England. It will be a challenge to maintain the quality and accessibility of services while delivering £20 billion in efficiency savings over four years. There is considerable uncertainty about how to define and measure quality outcomes. Case selection by non-public sector providers is very likely to distort the activity of public sector providers. And there continue to be concerns about the governance of new local commissioning arrangements. The reforms will not have any effect on what people pay for health care whatsoever. What will change is the relationship between the patient and the local GP, who will no longer just represent the interests of the patient, but as commissioner, may potentially become a rationer of care. Up to now, GPs have been able to blame the primary care trusts for constraints on access to care. When they actually become responsible for the clinical commissioning groups, they will have to assume that responsibility. However, patients will be able to choose between GPs, which they are not able to do at the moment, and will have more information about outcomes in different organizations and individual practices. That should improve quality and performance. The reform will bring about significant changes and the survival of the NHS may depend on the introduction of additional revenue, be it an increase in central government funding from general taxation, an additional health tax, more co-payments or the introduction of some form of compulsory health insurance. The possibility of restrictions on the range, quality and quantity of services provided by the NHS cannot be discounted; and neither can the introduction of a full market economy in the provision of health care within England. Sir Jonathan Michael is a graduate of St. Thomas’ Hospital Medical School in London, U.K. He was appointed Consultant Physician and Nephrologist at the Queen Elizabeth Hospital in Birmingham and became a Fellow of the Royal College of Physicians (London) in 1985. In the 1990s, Sir Jonathan was appointed Clinical Director, then Medical Director and finally Chief Executive of the University Hospitals Birmingham National Health Service (NHS) Trust. In 2000, he became Chief Executive of Guy’s and St Thomas’ Hospitals NHS Trust in London and led this organization to become one of the first Foundation Trusts in the NHS. 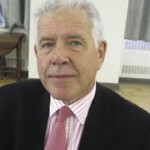 Sir Jonathan has held a number of regional and national roles, including Chairman of the Board of NHS Innovations (London), Chairman of the Association of U.K. University Hospitals and Chairman of the Board of the NHS Foundation Trust Network. He was knighted in 2005 for services to the NHS. He served as Managing Director of BT Health between 2007 and 2010, before returning to the NHS as Chief Executive of the Oxford Radcliffe Hospitals NHS Trust.